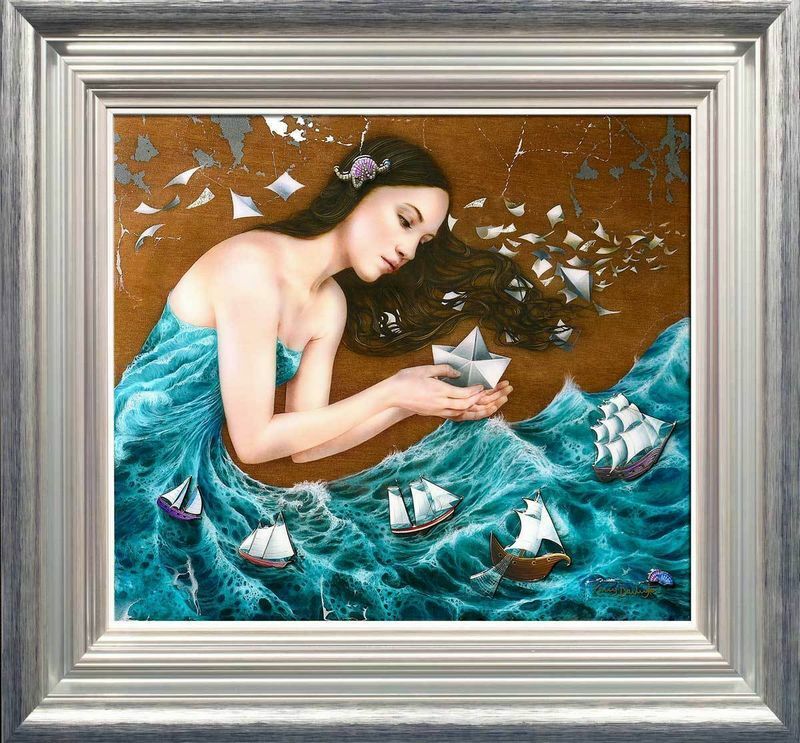 The Paper Boat - framed by Kerry Darlington // £895.00. Currently showing a snapshot image of part of the new Unique Edition: 'The Paper Boat' which looks to be figurative in nature, are you excited yet? This is Kerry's St Valentine's day release for 2019 - Update: final image now live and its wonderful! We have just heard that each limited edition artwork will come with its own collectable charm as a gift from Kerry to you. Kerry sees ‘The Paper Boat’ as a story book image, full of enchantment and of course pure fantasy; undoubtedly the theme is of a great journey for these tall ships and their crew, perhaps similar to her last release ‘Journey to the Ice Palace,' where the characters where travelling to the White Queen's home! It does bring to mind another of CS Lewis's great works from The Chronicles of Narnia: ‘The Voyage of the Dawn Treader’ and again a book adapted for the BBC some decades ago! The sea and the power of nature has always been present in Darlington’s many and fascinated by origami and its complexity, Kerry places a ‘Paper Boat’ into the middle of the scene, with the lady cupping it in her delicate hands. Released February 2019 – this is Kerry's 3rd release since returning to self-publishing last year. What makes this even more collectable is that its an edition of just 95 and that is small indeed, do be quick.